Join us on April 13-14, 2019, for Mountain Goat Trail Race Weekend, sponsored by Mountain Outfitters. The run/walk on Saturday is the same route as the first 5 great years. This year’s half-marathon on Sunday starts in downtown Sewanee and ends in Tracy City. We also have 3+ more miles of the paved Mountain Goat Trail as the course this year! Saturday night features the Trail Weekend Hootenanny at Baggenstoss Farms, a collaboration with the Friends of the South Cumberland. One ticket to the Hootenanny is included in each race registration; additional tickets (adults $10, kids free!) can be purchased here. 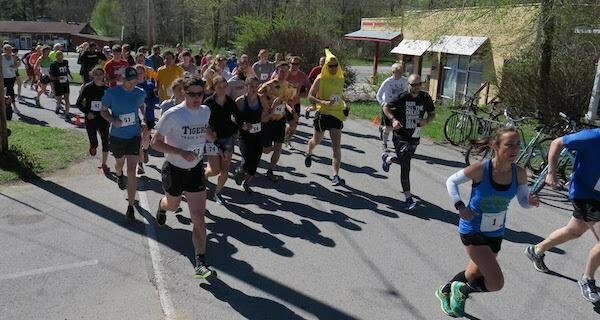 The 6th annual Mountain Goat Trail Run & Walk will be held on Saturday, April 13. Online registration is through UltraSignup until 5:00 pm on Friday, April 12th. Event-day registration Saturday morning will be at Pearl’s (walk) or Angel Park in downtown Sewanee (run) between 8:30 and 9:30 am. Online entrants will need to check in at the start. The 5-mile run will begin at 10 am in downtown Sewanee; a 2-mile walk will begin at 10:00 at Pearl’s restaurant. Both will finish at Mountain Outfitters in Monteagle. Prizes will be awarded for fastest men’s and women’s times. Registration is $25 for students; adult registration is $40 until April 6 and $45 on the day of the race. Registration includes Technical T and food at the finish at Mountain Outfitters. Prize drawings and presentation of winners are planned after the run. All proceeds benefit the Mountain Goat Trail.